In-line with the national requirement for professionals to drive the country towards a knowledge based economy, the government in its budget speeches of 2014 and 2015, made provisions to establish a Faculty of Engineering and Technology in the University of Sri Jayewardenepura. Following this initiative, Professor Sampath Amaratunge, the Vice Chancellor of the University, appointed an Advisory Board consisting of renowned personalities to proceed with modalities in establishing the new Faculty. 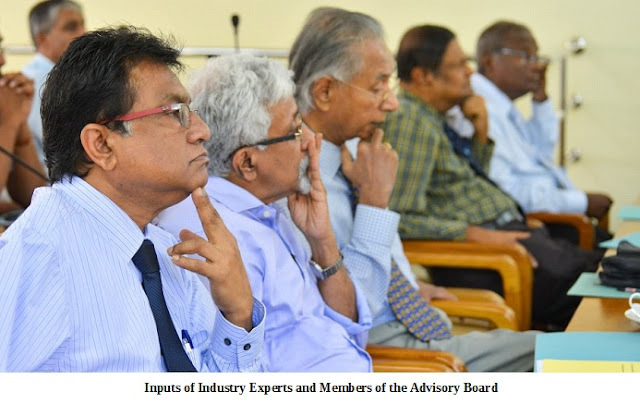 This Advisory Board was composed of Professors, D. A. Tantrigoda, M. M. Karunanayake, Ajith Abeysekara, Krishan Deheragoda and P.B. Mandawala. Emeritus Professor N. R. Arthenayake, who was a former Vice Chancellor of the Open University of Sri Lanka (OUSL) and a Dean of the Faculty of Engineering Technology of the OUSL and Senior Professor of Mechanical Engineering, was appointed as the Lead Consultant to shoulder the task of establishing the Faculty of Engineering and Technology. This proposal was approved by the Senate and the Council of the University. Four Senior Lecturers, namely Dr. S. A. A. M. Subasinghe, Dr. C. de Alwis, Dr. M. Mohamed and Dr. K. M. C. Konthesingha, were recruited to proposed Faculty of Engineering to be engaged initially in the task of developing an Engineering Degree programme, under the guidance of Professor Arthenayake. The curriculum is in compliance with the international standard for an engineering degree programme, namely the Washington Accord of the International Engineering Alliance, for which the Institution of Engineers, Sri Lanka is the authorized body for accreditation. In addition, the curriculum also conforms to the requirements of the Sri Lanka Qualifications Framework. A special feature of the curriculum is the provision for students to follow a 'Minor' area of specialization in an 'Emerging area of Engineering' relevant to his main area of specialization. Such options include biomedical engineering, environmental engineering, high performance computing, mechatronics engineering, etc. The Degree programme also intends to promote Student Centered Learning, in which regular lectures and practical laboratory work are supplemented with activities such as projects, seminars, presentations, assignments, field work, etc. In addition, industrial training that provides an undergraduate with real-life work environment in the world of work, is an integral component of the Degree programme. 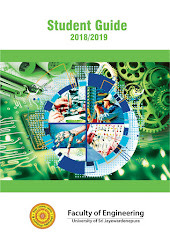 Emphasis of the Degree programme is to inculcate the attributes and professional competency profiles as identified by the Washing Accord, such as Engineering knowledge, Problem analysis, Development of solutions, Investigation, Use of modern tools, Role of engineering in society, Sustainable development, Ethics, Communication, Project management, Lifelong learning and Contribution to community. Prominent personnel from the industry were consulted to incorporate their inputs to the curriculum development process and the delivery of Degree programmes. This paved the path for the new Faculty of Engineering to build enduring relationships with the industry. Together with the inputs from the Advisory Board, CCE and the Industry, a proposal was formulated to be formally submitted to the University Grants Commission. This proposal was presented to His Excellency the President Maithripala Sirisena in August 2015 at the Presidential Secretariat. 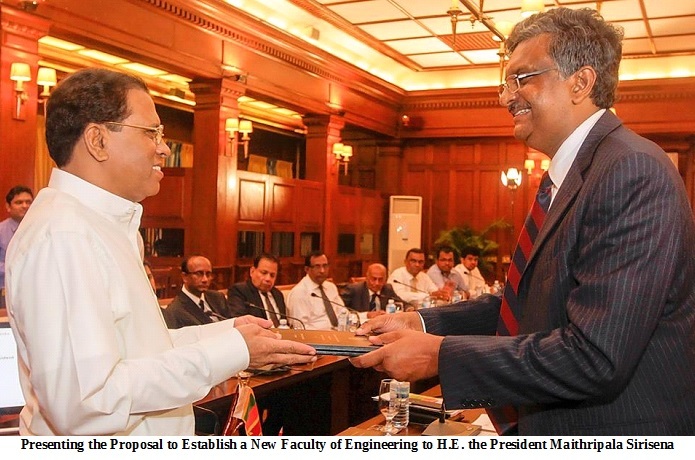 During the function His Excellency the President conveyed his blessings and support to the new Faculty of Engineering. 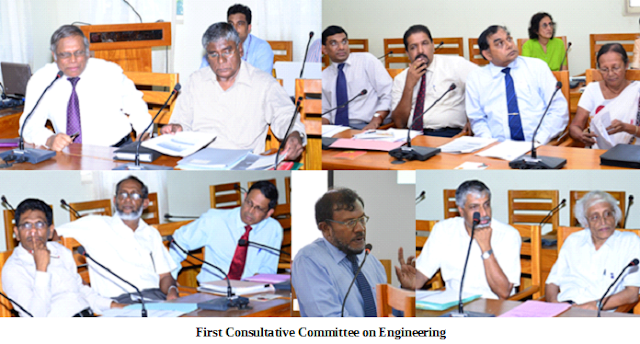 The University Grants Commission approved the proposal to establish the new Faculty of Engineering at the University of Sri Jayewardenepura in December 2015. The new Faculty along with its Departments of Study were gazetted in January 2016. Following the gazette notification, heads were appointed for each departments of study, as follows. The Hon. 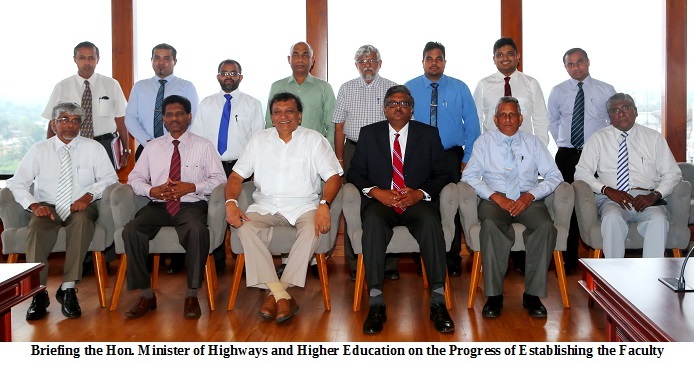 Minister of Highways and Higher Education was briefed on the progress of establishing the Faculty in February 2016. Dr. S. A. 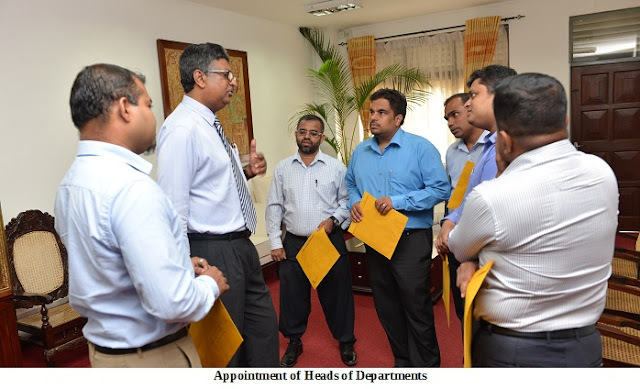 A. M. Subasinghe was appointed as the first Dean of Faculty. He assumed duties on 18th July 2016. 120 students, who achieved exceptionally good results in the G.C.E. (Advanced Level) examination (physical science stream) were enrolled to the Faculty as its first batch of students on 30th November 2016. Welcome to the latest Faculty of Engineering in Sri Lanka. Keeping in line with the University’s Vision of “Prosper lives through education”, the Faculty will serve to realize aspirations of thousands of students by providing engineering education through the state sector. Copyright © 2016 Faculty of Engineering, University of Sri Jayewardenepura. Simple theme. Powered by Blogger.